you are here : home > vehicle & technology > Toyota Pearl Toyota's Dealer Co., Ltd.
Toyota Pearl Toyota's Dealer Co., Ltd.
Toyota Pearl Toyota’s Dealer Co., Ltd., the dealer in Phuket over 27 years experience which proud to serve the greatest service to every customer with honesty and sincerity while we are going ahead on the development and step in the international standard procedure on the latest high technology. Toyota Pearl Toyota’s Dealer Co., Ltd., we always give the convenience, fastest and accurately in every detail to our customer to reflect their extremely satisfaction. For more information or any appointment please, contact at our call center 076 -377611. Just only contact at our call center prior 1 day, you can get discount 10% off for auto spare part. Furthermore, Toyota Pearl works on “Express Maintenance” for checking every 10,000 kilometers or 6 months and can receive your car back just only within an hour. Special promotion! 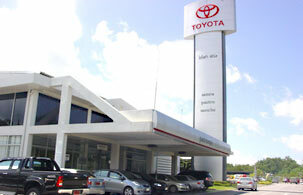 Now only visit us at Toyota Pearl, you will receive the best full service for your convenience. It’s not only a financial company with Toyota Leasing but confide on First-Class Insurance service with Toyota GOA. If you got problems about coachwork and automobile paint, we have coachwork and standard automobile paint center to serve you all the time here and guaranteed before every repairing. Ensured on our quality and standard of TOYOTA.